So, about 2-3 years ago, after a few years of looking, I bought a mojo shell and a refined artist shell. I initially had plans of experimenting with electronics and paint. The seller didn't know much about them, and I bought "as is," so there was a little risk that the truss rod or something might not be right. 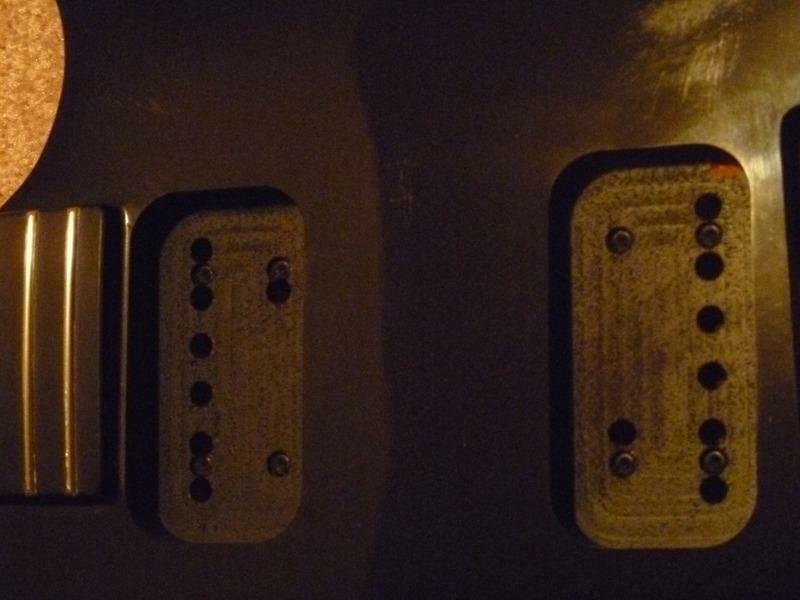 Once I got the mojo, it turns out that the reason it was a factory reject was because the pickup routes were off center. There was also a crack near the bridge, but that was probably just from poor handling as this was intended for scrap. I knew I had to patch the pickup routes, reroute, and maybe repaint. 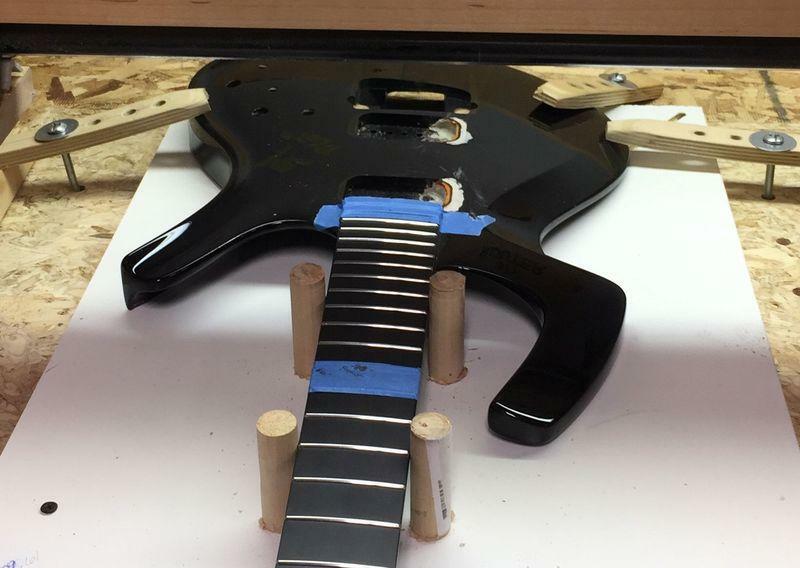 Because some of the bridge parts are hard to find, and I had easy access to a cnc router at the time, I decided I would fill in the trem cavity and route for a tune-o-matic style bridge. However, at the time I developed some complications with eye allergies which prevented me from doing much shop work. Then I changed jobs, and moving back to my home town delayed all this and other projects quite a bit. Getting settled, starting a business, and some family health issues further delayed things, and I also wasn't sure where I could find a CNC router around here. the drawing board, but I also decided to update the design of the mods to accommodate deeper pups like the EVOs. People said it couldn't be done, but I was pretty sure it could. 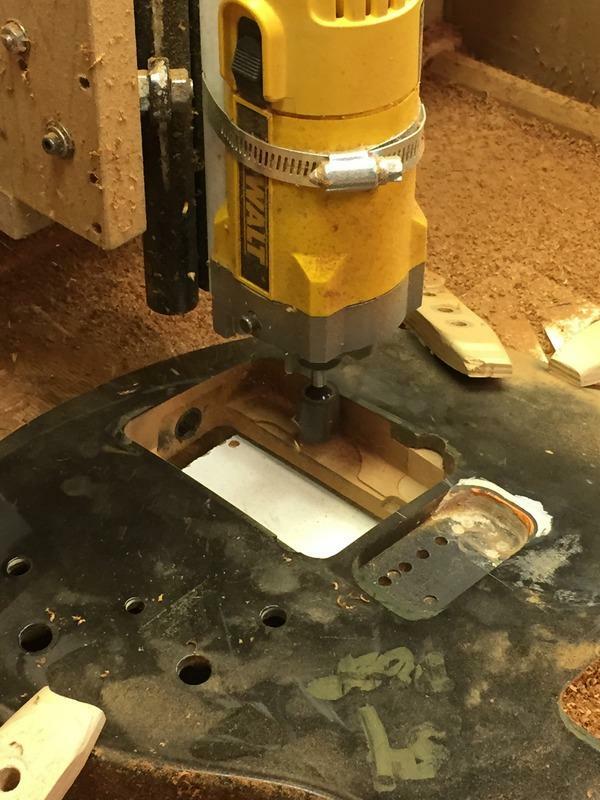 Fortunately I recently discovered a local maker space where I could use a home built CNC router. And then I realized that it was going to be hard get the shell in alignment with the three axis of the machine. 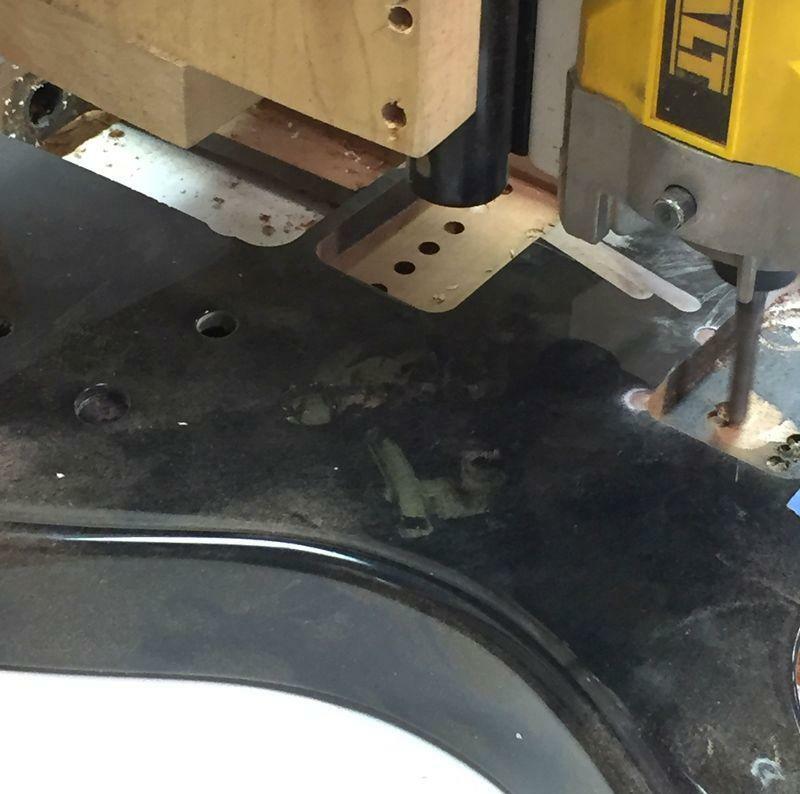 So, I designed a fixture to be routed on the machine. This allowed me to square everything up relative to the table, and clamp the shell down. Next, I machined a bigger pocket at the trem to fit the filler block. I did a pocket instead of a hole to avoid cutting the carbon fiber on the rear, and also mechanically, I felt it was a better joint than just going straight through. Then I routed the new pup locations, crossing my fingers that I wouldn't blow thru the back at the neck pup. Its really close, though I probably went deeper than I needed, and I extended the route to allow mounting using the pup ears vs traditional fly polepiece mounting. I did this primarily because I wanted to try the evo pups and the back plate is solid- the pole pieces don't protrude through. Then I used two sided machining to make a filler block of mahogany, leaving it 0 .25mm proud top and bottom. I don't have the actual surfaces in CAD of the shell, so I estimated the surface based on a few measurements at the pocket's corners. The extra material allows for sanding flush. 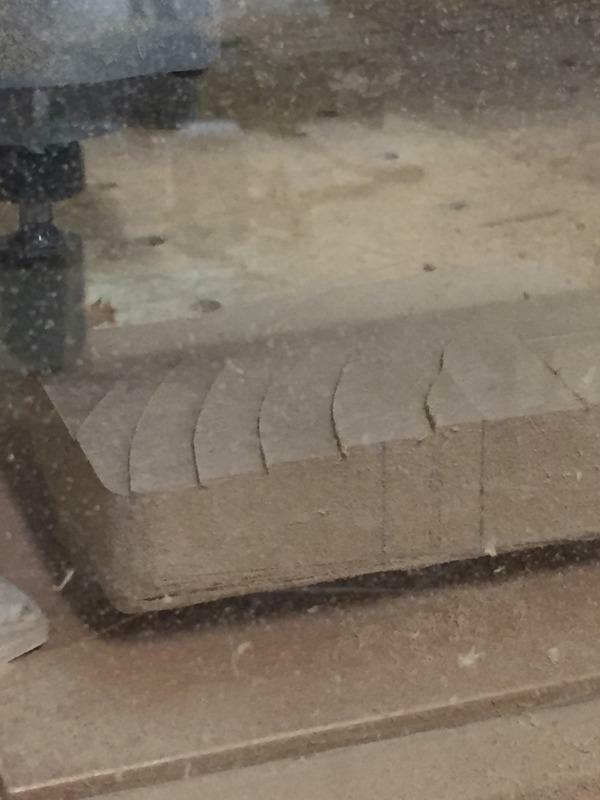 It turns out I probably could've just machined at actual height, my CAD surfaces were pretty accurate and the router was too. I made a slight inset shoulder to help hide the edge with epoxy, but I think I need to go a bit more aggressive so I can feather the epoxy out better. 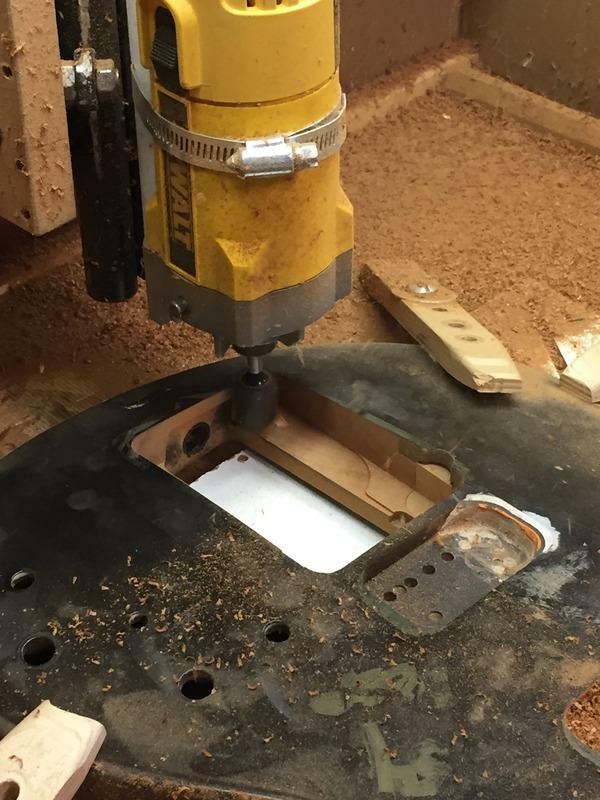 Once I glued the block in and sanded flush, I routed the new holes and pocket for the TOM. I put things together just enough to see how pups and bridge fits. The nut is quite high and I'll have to work on that. But the bridge and pups worked out better than I hoped, it needs very little in the way of intonation adjustments. There's a little paint chipping around the edge where the shell was cracked on the face, and some "extra" routing between pups where I didn't allow enough clearance height in CAM, but overall I'm pretty happy with how it came out. I'm not sure how much I like the EVO pups, but I have only played this at low volume. I think they will really come alive with more volume. 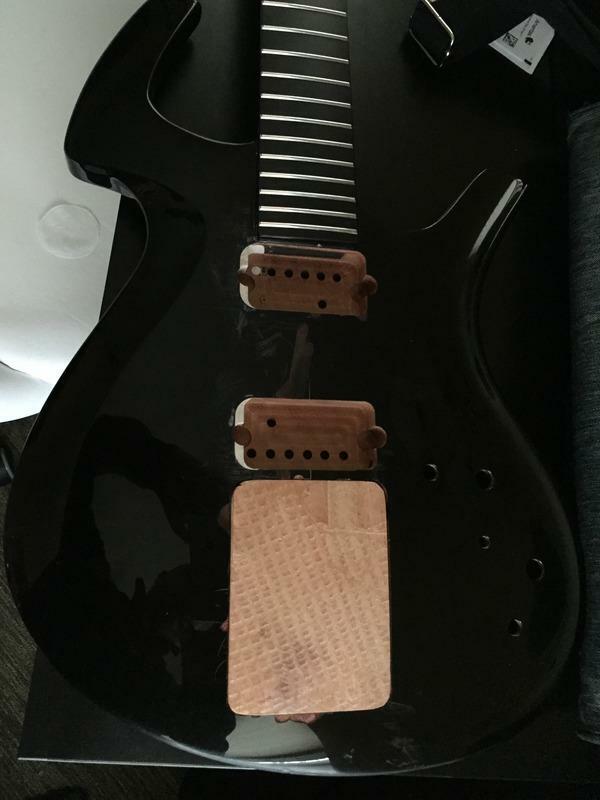 I am a little disappointed that the pole pieces are mismatched between neck and bridge, I'm hoping DiMarzio will allow me to buy some or I can source elsewhere so I can get them to match. Next steps are to drill holes for ferrules on top and bottom. Also, I had the TOM pocket off center to account for the intonation screws, but I think I will enlarge the pocket a little so its centered relative to the bushings. There will be a bigger gap around the tail but I think it will look better. I dremeled a little out on the treble side to get a sense of things. I'll also dremel a slightly wider depression on the top and bottom seams to allow filling with epoxy and help avoid any transmission of the seams through the paint. Once all that is complete, I will take it all apart and prep for paint. Not sure what I will do in terms of paint, but I have a few ideas I'm playing with. It will be a little while before I can paint anyway, unless I can get access to a paint booth locally. I realize some of you will probably consider me a heretic spitting into the wind, but the guitar is light, resonant, and plays pretty well even with a really high nut. The other day was thinking that the original fly prototype has a TOM? I really like the graphtech bridge, but I may swap this for one with piezos. I'm still on the fence about doing a similar thing with the artist shell, though if I do I won't change the pup routes. 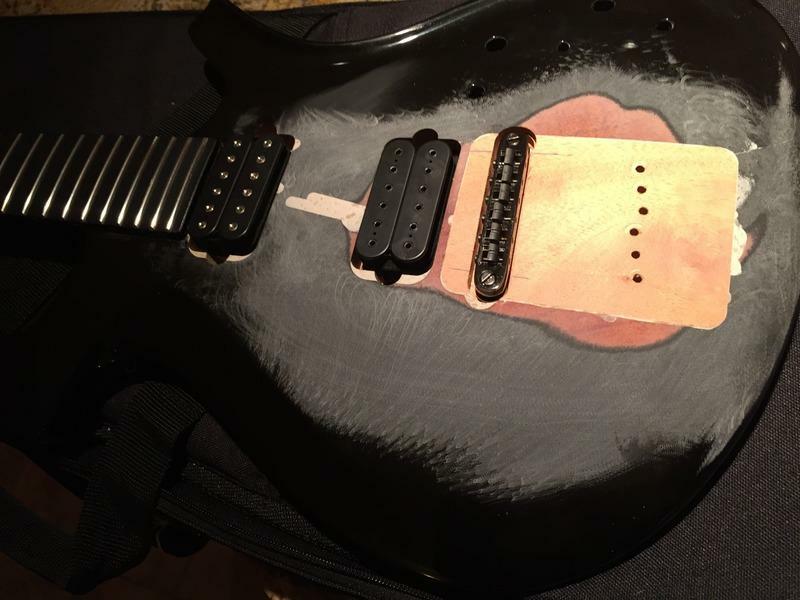 It had different issues that I'll post about in a different thread sometime in the future, but I think it will also be a great guitar when put together. So, to be continued..! Questions or comments welcome; I will answer to the best of my ability. Wow! I'm pretty sure this is my new favorite post ever. thanks guys! I will add that it is a little nerve wracking when that router bit is spinning at 12000 RPM, but very cool to see it finally coming together. 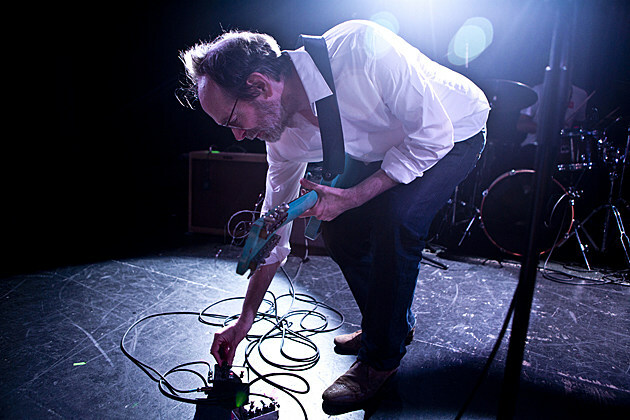 Can't help smiling because the stickied post in this category is "Please read before modding your guitar." Safe to say I voided the warranty. That is nicely done, look forward to seeing the final paint! Thanks, will post updates as I go! Just seeing that first picture with the router....brrr.....shivers! The most scary thing for me was the thought that I may have overlooked something in the planning that would make the entire approach not work, like not being able to sink the bridge deep enough for some reason. Oh what it must be like to be delusionally self confident... I could be president or something. In keeping with delusional, I think a double neck is certainly doable. I found a carbon fiber patch kit that could help, though likely not needed since there's actually plenty of thickness near the bridge to make a very strong joint between bodies. Question is, what would you do with two six string necks? Ie no 12 string available, 7 is rare, etc. Unless you're thinking Parker and non Parker joinery? Blasphemous! 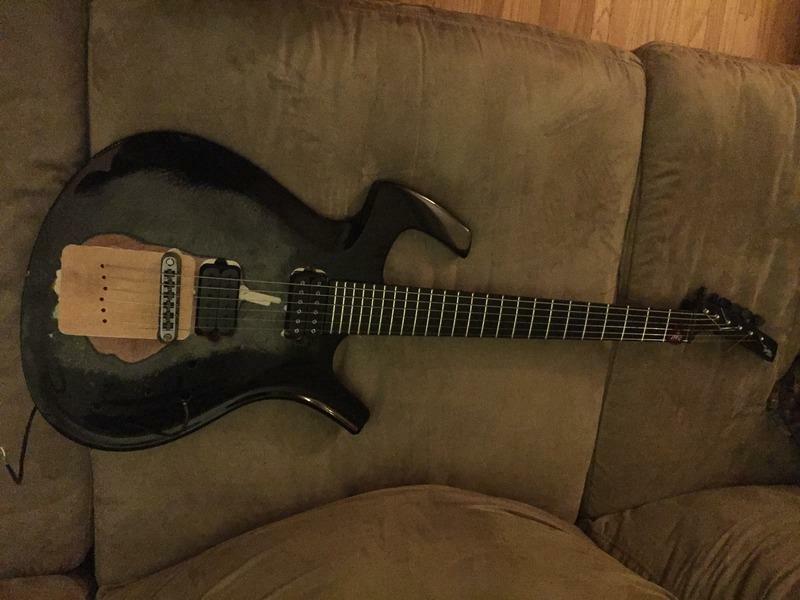 Hows about the standard Parker layout for the upper neck and the lower neck as a nylon string piezo hard tail hollow body with a synth that routes thru both outputs? While we're at it, let's make that a 3D printed CF neck and body with a one piece design (slide on fitment bonded to the body?) that mimics exactly the Parker neck and contour. 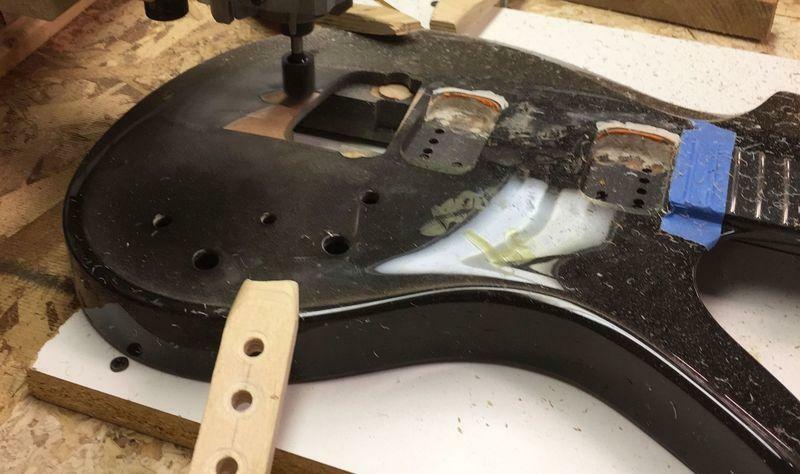 Making it a string-through short scale might not mess with the current electronics and require less machining that still yields a connection to the original guitar dynamics. 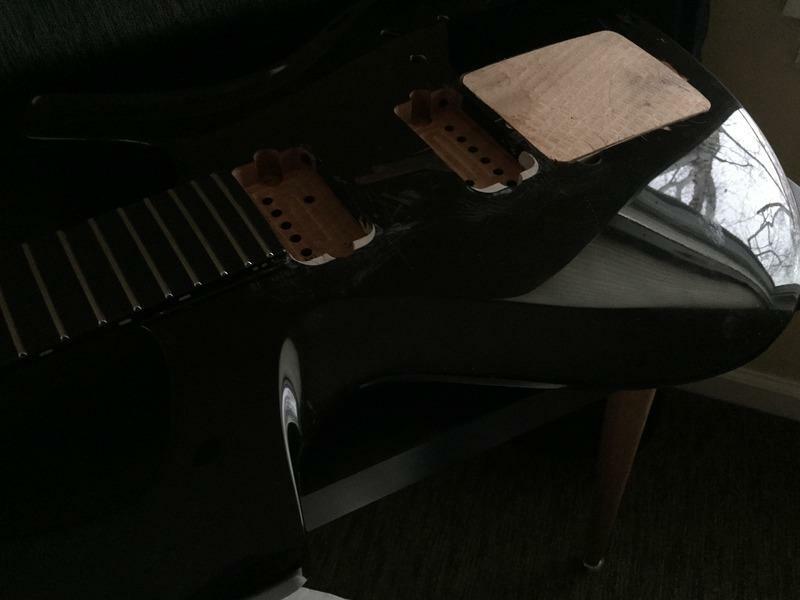 I know absolutely nothing about practical guitar design or fabrication so this is pure speculation on my part. Yeah, mag-less nylon string maybe? Cool ideas here... not sure I want a double neck nearly enough to use these shells. If they had PDF factory rejects I'd be willing to play with those. Or some other shells that are pretty far gone, missing horn etc. Before anyone jumps on that, I'd feel a lot more comfortable about it if I had all the surfaces. There could be some tricky blends between bodies that would be better handled initially in cad vs a router bit and a hasty prayer. A way to 3D scan would be great. I think the Spanish fly is nylon. So yeah that could work out nicely. 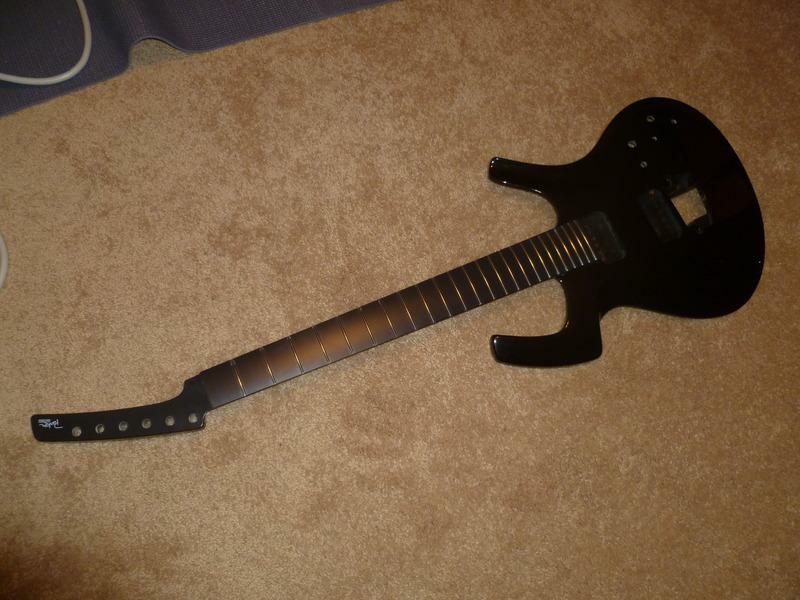 Fretless is really interesting, need a sustainer though. But I think I could install one of those now. I've done a good bit of 3D printing. Super cool but I'm not impressed with much of it as guitar making materials though. Dream big, always! At least they can't take that away from us... yet. I couldn't have said that better! OW! And EVERY spare Holiday moment went to the drawing board. Jeez. Well, at least it will look good. I may have to go back to trying to make it as a guitar player. Ha! Anyway, I think the only real question I can think of out of this thread at this time is: Do you think you could effective route a fly for a Khaler Trem? I'm not saying I like them better, just that those are the 2 'out of production' terms I liked best. I think it was Tosh on the boards here who had wanted to do that. I don't know about the angle parker them vs what the Khaler wanted, but it seems after looking at the block you fit in that it would work. 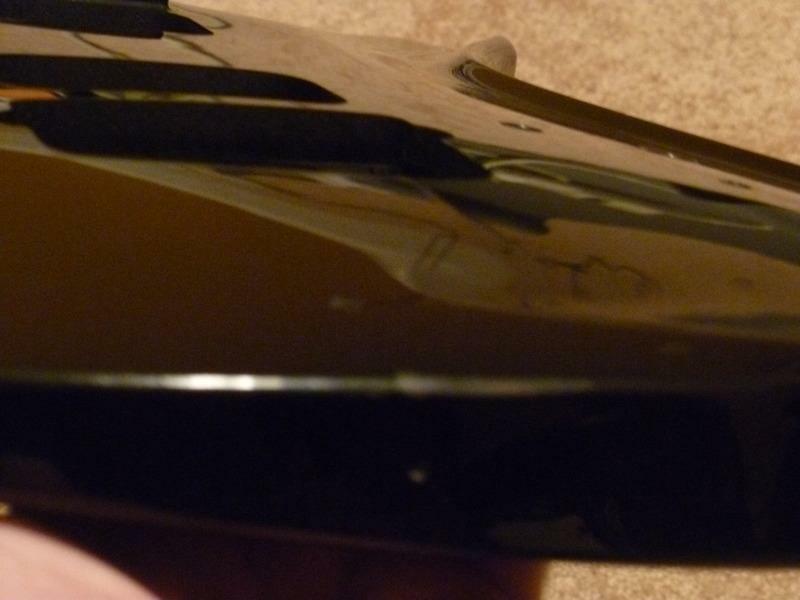 How are you planning on dealing with the carbon fibre over the patch point and the final paint job? That's the thing that always slows down my ambitions with these guitars. Well, that and learning more songs. Everybody needs to learn more songs. lol... I know how that goes. Doing work you love is worth it even if the money isn't great. It might always lead to something else too. I think it was patzag that did the Kahler on the chromed hard tail fly. I don't remember how it ended up with the Kahler but I think he sold it. The few times I tried a Kahler back in the day, I didn't like it. So I'm most familiar with the Floyd style and the Parker. But I don't see any reason why you couldn't do most any trem or bridge once the cavity is filled. The fly is about 1/4" thinner than a strat near the bridge. So the exception might be the Floyd block height on an original fly being too high. They have shorter blocks available now, and it could be shaved further if need be. I'd have to come up with another fixture to do routing on the rear side. But I think I know how I'd do it. I bought a patch kit for the rear but I think it probably doesn't need it. It's a pretty small area and adding new wood is already stronger than the open cavity. Right now it looks pretty similar to the top. I'm not sure the patch will do anything here. I have a few ideas for paint. I could do an old school lacquer job but it takes forever so I'm thinking of trying to find a booth I can rent and spray some of the newer paints that dry faster and harder. I definitely need to learn more songs. Mmm...fretless doesn't necessarily need a sustainer. My buddy here in Melbourne plays a Vigier fretless, does fine without it. That guy drive me mad when I first saw him !